Affectionately known as 'The Communication Diva', Communication Coach, Terry Neason, is highly praised by Leaders and Management for her expertise and rated as a top class service provider. Terry enables those who work with her to achieve excellence in Communication Skills, Public Speaking and Personal Impact. 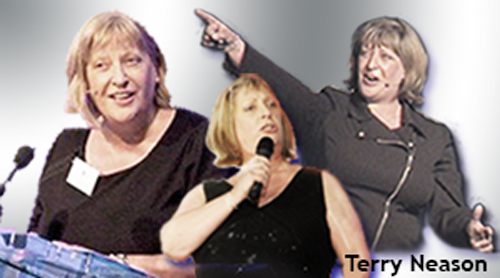 As well as providing Personal Development & Communication Training, Terry is an acclaimed Speaker, Singer and Entertainer. Terry's eclectic business career spans over 30 years. Having run a business, presented her own television series and toured shows around the world, she knows what it takes to command an audience and Walk the Talk. A great believer in professional and personal development, Terry has motivated herself to achieve high standards throughout her career. It is the wealth of street-wise experience in life and business, combined with her warmth and humour, which gives Terry a down to earth and entertaining style as a Communication Coach. MC & Motivational Speaker. "Terry will assure you of straight talking performance improvement... improvements were noted immediately"
"You are a master of removing people from their comfort zone and enabling them to explore their potential.. a masterful roller-coaster of learning." "Loved My Body And Me session - it was entertaining, powerful, thought-provoking & empowering. Thank you!" "Once again Terry has worked tirelessly with our organisation with immediate results"
"The advice on language, posture, dress, slides, breathing and delivering with emotion and conviction was spot on. Your commitment to helping me was second to none. As they say you've had the rest now get the best." "The Powertalk sessions with Terry, were hugely insightful and encouraged real critical reflection about all aspects of personal communication. The lessons learned will be of value on a daily basis and cumulatively will make a real difference." "Thanks Terry, for your contribution to Ryden's Annual Conference. The final afternoon session is a traditional challenge which you met face on with expertise and energy...informed and uplifted our circa 50 senior management team. The evening's cabaret, which you later performed following dinner, provided a wonderful close to the formal proceedings." "You certainly proved that you are indeed a 'Communications Diva'. Your all round creative talent captivated all who were prvileged to be present...your performance will long remain in our memory." Terry Neason is Scottish and spent her childhood in a raunchy housing scheme in Glasgow. Terry says, "I always used humour to steer clear of sticky situations. I shot from the lip, as opposed to the hip"
At 16, she turned her back on the street fights, left home and ventured to London for the first time, where she added to her life experience by working in New Horizon, a centre dealing with drug abuse and homeless youths. Then going on to work with ex-prisoners in R.A.P. Radical Alternatives to Prison, dealing with re-homing and employment issues. One of her biggest dreams was to sing, write and act. However, previously, music had been disallowed as a specialist subject in school. Undeterred, Terry went on to develop her talent and performing style. With no formal training, Terry began her singing and acting career with two of Scotland's top companies; 7:84 Theatre Co. and Wildcat Stage Productions. Both companies being known for their innovative shows, which tackled social and political issues of the time. She hosted her own 6 part television series of chat/music/comedy, for STV, called The Terry Neason Show. Her professional journey took her into the business of managing her own company, Wee One Productions, for 15 years; leading a team, which produced highly acclaimed shows for Corporate Events and Theatre. It was at this time Terry learned a lot about selling and negotiating when dealing with Theatres and International Festivals. The award winning performances captivating audiences from Europe to the USA and from Canada to Singapore. "At first I was sceptical about NLP, Neuro Linguistic Programming, thinking it wasn't for me. However, I kept an open mind and after doing my research, it was the mind body connection aspects and effective use of language that really inspired me. I acquired the knowledge of these excellent techniques and went on to qualify as a Master Practitioner. Being honest, I don't live and breathe NLP, I simply implement what works best for me personally and for my clients."